Kills Influenza A2 Virus on Hard Surfaces. 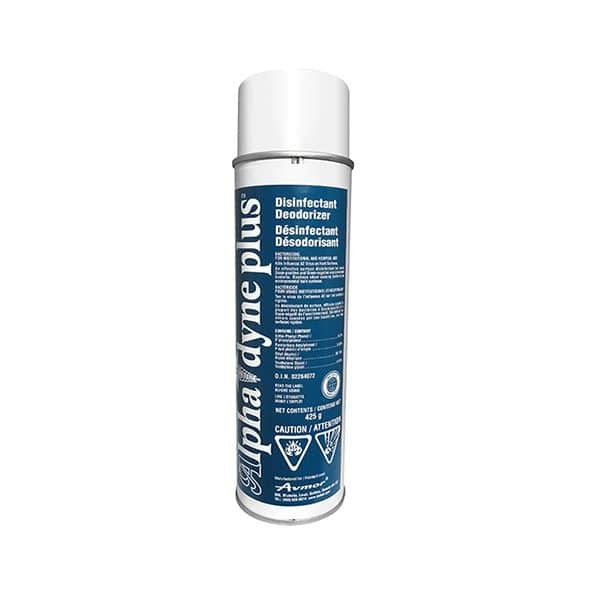 An effective surface disinfectant for most Gram-positive and Gram-negative environmental bacteria. Destroys odour causing bacteria on environmental hard surfaces. 1) Hospitals on inanimate hard surfaces such as dressing carts, hampers, linen carts, wheel chairs, metal springs, toilet seats, telephones, light switches, wash basins, urinals, door knobs, air ducts and other similar germ laden hard surfaces. 2) Food plants on inanimate objets in those areas where food is manufactured, prepared or stored. Kills Staphylococcus aureus, Salmonella choleraesuis, Pseudomonas aeruginosa, Escherichia coli, Trichophyton interdigitale and Mycobacterium tuberculosis. DIRECTIONS FOR USE: Shake well before spraying: Hold can about 10-20 cm from surface, spray evenly until a fine mist covers surface. All soiled surfaces must be cleaned prior to disinfection. HOSPITAL DISINFECTION: Cover entire clean surface with mist. For effective germ killing action, keep surfaces wet for 10 minutes. Do not use in hospital nurseries. FOOD CONTACT SURFACES: Cover or remove exposed food. Spray on pre-cleaned surfaces. Keep surfaces wet for 10 minutes. Avoid contamination of food in the application and storage of the product. CAUTION: All food contact surfaces must be rinsed with potable water before re-use. TO ELIMINATE ODOURS: Spray upward into room for 2-3 seconds. Do not use on polished wood furniture or rayon fabrics. CAUTION: KEEP OUT OF REACH OF CHILDREN. Contents under pressure. Do not place in hot water or near radiators, stoves or other sources of heat. Do not puncture or incinerate container or store at temperature over 50°C. Do not use in presence of open flame or spark.